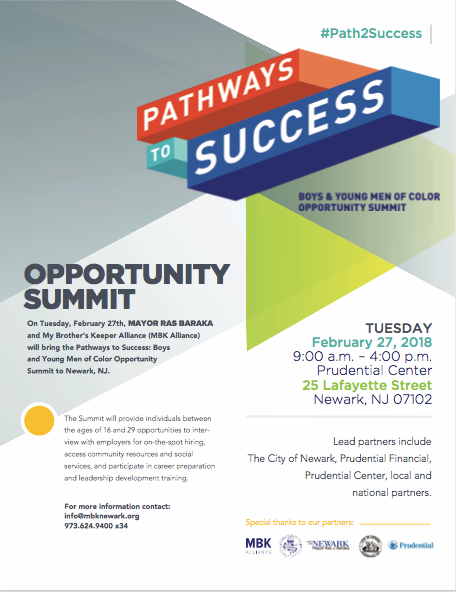 Newark, NJ – February 22, 2018 – Mayor Ras J. Baraka, My Brother’s Keeper Alliance, Prudential Financial, Inc., the Prudential Center and other partners will host a one- of-a-kind event for males aged 16 to 29 entitled “Pathways to Success: Boys and Young men of Color Opportunity Summit” on Tuesday, February 27, from 7 a.m. to 4 p.m., at the Prudential Center. The center is located at 165 Mulberry Street in downtown Newark. At the summit, more than 1,000 Newark boys and young men of color and other underserved youth will have opportunities to do job interviews with employers for on-the-spot hiring, immediate access to community resources and social services, connection to mentors, and a chance to participate in career preparation and leadership development training sessions. Some of the companies offering on-the-spot employment will include Prudential, Starbucks, AutoZone, and Whole Foods. This is much more than a job fair. There will also be workshops on dressing for success, MENtoring, resume preparation, Technology and Social Media, Entrepreneurship, Hip-Hop Development, Barber Shop, professional headshots, public benefit screening and enrollment, career and technical education, high school re-engagement, youth organizing opportunities, and legal support services. My Brother’s Keeper Newark (MBK Newark) was organized by Mayor Baraka in 2016 in response to a national call to action by President Obama. The initiative furthers the mayor’s mission to address persistent opportunity gaps faced by boys and young men of color in Newark and ensure that all young people can reach their full potential, regardless of who they are, where they come from or the circumstances in which they are born. Prudential is a founding partner of My Brother’s Keeper Newark. Since 2015, Prudential has provided nearly $1 million in grants to establish MBK Newark as a community initiative that is leading Mayor Baraka’s call to action to support boys and young men of color in Newark. Prudential’s support of MBK Newark aligns with the company’s commitments to opportunity youth, and reflects Prudential’s long history of supporting educational attainment and success. This work also leverages the company’s investments to support public safety initiatives, like the Newark Community Street Teams.